University Park, Pa. - The Youngstown State women's golf team placed sixth at the Nittany Lion Invitational which concluded on Sunday. The Penguins posted a three-round score of 931 at the event. YSU had rounds of 314, 308 and 309 at the tournament which was won by Penn State. PSU carded a three-round 889 to beat Delaware by six shots. William & Mary was third, Rutgers was fourth, Towson was fifth ahead of the Penguins. Leading the way for YSU were freshmen Gabby Minor and Christina Cooper. Minor had rounds of 74, 76 and 78 at the event to finish in a tie for 13th place with a 228. Cooper was steady during the tournament with rounds of 78, 77 and 78 carding a 233 to finish in 21st place. Sophomore Courtney Shutt had scores of 80, 77 and 78 posting a school of 235 and came in 26th while junior Mia Barchetti was 43rd with a 245. 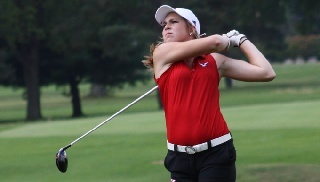 Barchetti had YSU's lowest round on Sunday with a 76. Emily Dixon competed in two rounds and scores of 78 and 77 while Megan Creager had scores of 82 and 81. The Penguins are next in action on Sept. 26 when they face Niagara in a dual at the Culbertson Hills Golf Course in Edinboro, Pa.